Instructions: To view a larger photo of this project, click here. First start with making construction strips, take a piece of white cardstock 12 x 12" and cut this in strips of 1" wide and 12" long score them in half and put on the back side of the strip on both 1/2 inch parts tape, then fold them in half. Use the Template from My blog http://elsschutte.blogspot.ca/p/heartfelt-creations.html and draw the outlines with a pencil on the cardboard and cut this out with a knife. For the sides you have to cut a long piece of 1 1/2" wide, now measure the sides of the bottle and make marks on every corner and cut them in with your knife (not all the way through, but just that you can bend them). Now you can use the construction strips to connect the side with the front and back, put 1 half of the strip on the front or back and then connect the side strip on the other half of the strip. The Bottom of the box stays open. When the box is done you can cut out your pattern paper - you can use the template of the bottle for it. Ink all the sides with Vintage Photo and glue the paper on the bottle. Also cover the matchbox with pattern paper and ink the sides with the same ink, and glue this part on the top. I found a nice piece of Crystal in the SOS store and I glued that on top. Around that, glue a string of silver beads around the crystal and on top of that you can glue a Butterfly. I put Crystal Clear on the wings of the Butterfly. Around the matchbox you can attach a string of bling on the roll, the wide one, I also did this on the Bottom of the Bottle. Around the sides of the Bottle I used the small one. 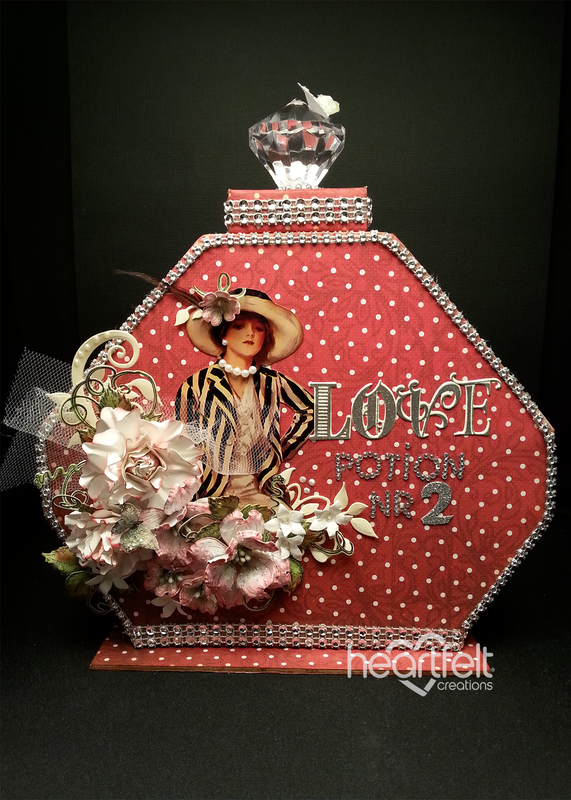 Embellish the box: Fussy cut the image of the lady (or any image you like) and glue this on the bottle, adhere small flat back pearls on her neck and ear. Stamp the word Love from the banners of love set on Crème cardstock with Versamark ink, add silver embossing powder on it, heat set. Diecut with coordinating dies and adhere. I added crystal letters stickers under this. Now stamp the classic rose vines, with the Versafine black on white cardstock, and color them with Bamboo Leaves, New Sprout and Vintage Photo. Die cut with the coordinating die, and shape using the Flower shaping kit. Stamp some dogwood flowers on white cardstock with The Rhubarb Stalk ink and color lightly with Rose Bud and New Sprout inks. Die cut and shape. Add some Crystal Clear, pierce the centre and insert stamens in the centre. Die cut Classic Rose, on white cardstock using 5 big petals to make the big rose and 5 small petals to make the small rose. After each layer color the back of the rose, and when the rose is finished you can ink the top of the rose with the Rose Bud and Rhubarb Stalk inks. Die cut the Window Box filler flowers on white cardstock. Cut the flowers off the stems, and shape, dot the centre with a pearl pen, allow to dry. Stamp some curly leaves from the Tropical Paradise set with black Ink on white cardstock. Color with the Bamboo Leaves ink and die cut. 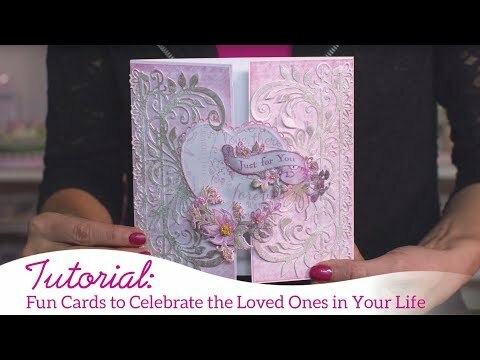 Die cut the Sweetheart Borders Die on cream cardstock and cut apart into smaller pieces, as desired. To assemble in this order: Start rose vines, tule, roses, dogwoods. In between the flowers you can fill in some spots with the other flowers and leaves you made, so then you have a nice arrangement. In between you can use the cut a parts of the border die and adhere those under the ends of the arrangement. Add dots using the pearl pen. I added a feather, border die piece and dogwood flower to the hat. For the bottom you cut a piece of cardboard 6 1/2 x 2 1/2" and decorate with designer paper. Cut 2 pieces of cardboard of 3/4 x 1" and 2 pieces of 3/4 x 4 3/4", decorate them with pattern paper and glue them together in the center of the bottom, now you have a little box. Ink all the edges with the Vintage Photo and the Bottle will fit over it.